The District of Columbia Public Schools celebrated its annual test scores this week, touting “historic high” results citywide. 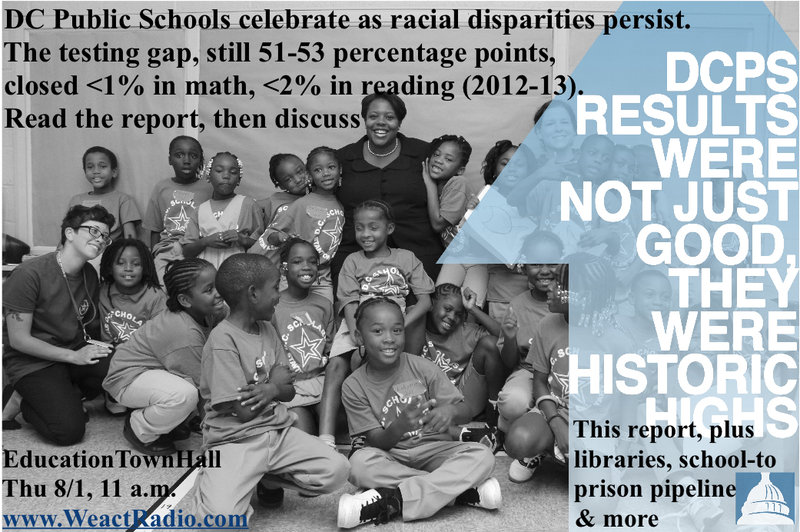 The score report indicates a drop of less than two percentage points in the achievement gap between African American and White students: In math, 40% of African-American students scored proficient or better, while 91% of White students did; in reading, the percentages proficient were 38.6% of African-American students compared to 92.1% of white students. Percentages for Free and Reduced Meal students nearly match those of African-Americans. Erase Racism NY produced this video about resource disparities, “A Tale of Two Schools: Race and Education on Two Long island Schools.” (English video with captions in Spanish.) Visit Erase Racism NY for additional resources. 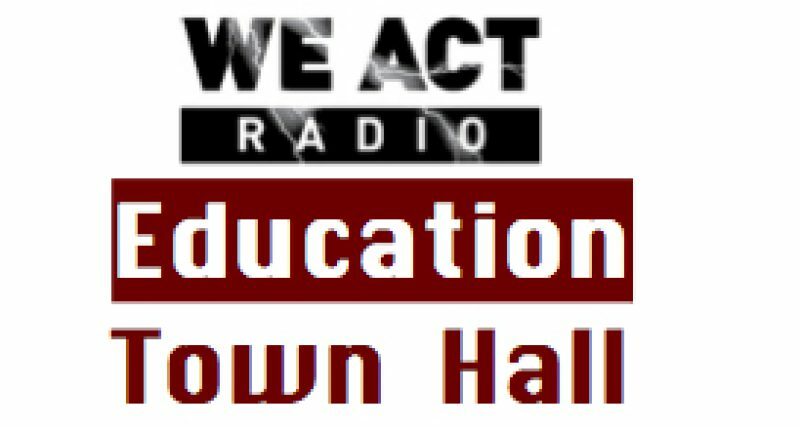 many alumni are now elected officials, policy and advocacy leaders as well as entrepreneurs that have launched innovative efforts to expand educational opportunity. No longer are TFA corps members only filling spots that would otherwise go to long-term subs. In some districts TFAers are replacing veteran teachers who have been let go. Other districts, like the one I used to teach in, appear to cycle through corps members every two years, with high turnover among TFA teachers who are in turn replaced by a fresh slate of bushy-tailed, ill-trained corps members. See also this NPR report. In addition to the DCPS report, here is DC’s “state” report from DC’s Office of State Superintendent of Education, which includes charters and DCPS. More from Education Week. When reading reports on the DC-CAS, be careful to read the actual numbers and not rely on DCPS graphics. 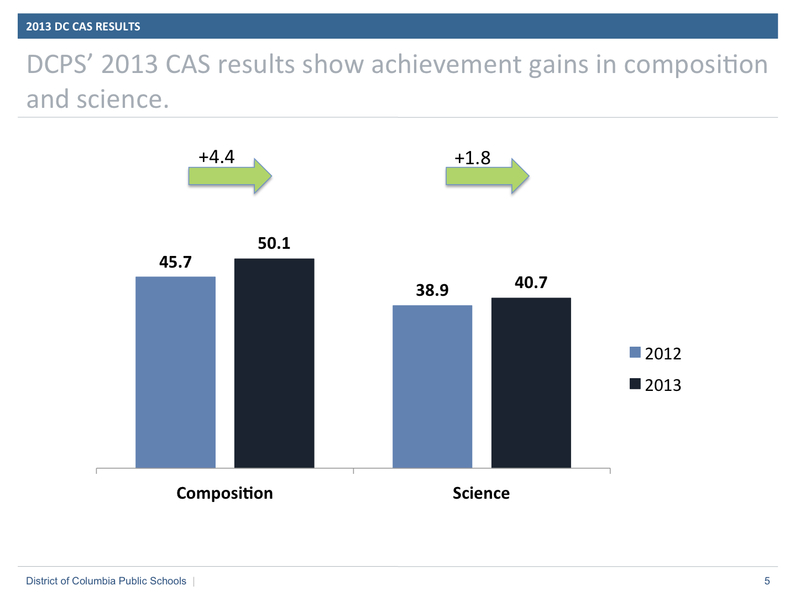 For example, page 5 of the DCPS presentation on the DC-CAS scores displays composition and science scores. The two bar graphs present the growth percentage from 2012 to 2013 in proportion to the scores. But the reading and math scores, on page 4, are presented in seriously misleading fashion. 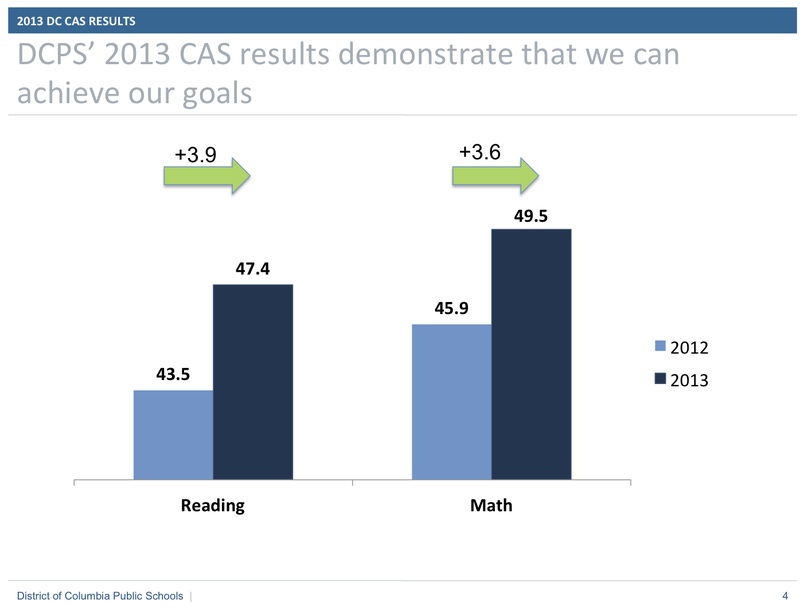 Page 4, with reading and math results for 2012 and 2013, declares that “results demonstrate that we can achieve our goals.” The graphic does give the appearance of great progress, displaying “47.4%” as a bar more than twice the height of “43.5%.” This seems to suggest that reading scores showed a growth rate of more than 100% over the previous year. The math bar graph gives the appearance of about 60% growth. In fact, of course, as the numbers actually who, growth was closer to 8% over 2012 scores. Be sure to read this year’s report in conjunction with more serious analyses of DC-CAS scores since 2007. For example: DC Fiscal Policy Institute analysis and DC Action for Children‘s Third Grade Brief. In addition, please keep in mind the many questions about the utility of these measures and how these tests feed the school-to-prison pipeline.